Lady Lisa here! 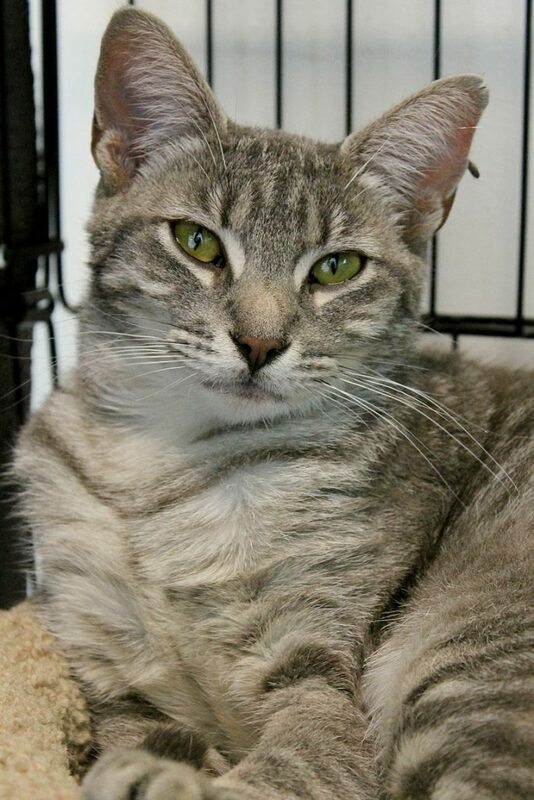 I’m a beautiful and petite little one-year-old tabby girl that is excited to meet you! I came in to Pixie as a young mom with two little kittens who’ve since found their new home — now I’m ready to find mine! I am an extremely social and active little kitty. When people walk by me, I’ll often reach my little paw out and ask for a string toy to chase! I had to spend a good part of my kitten-hood being a mom, so I still have a ton of playful kitten energy left in me. When playtime is over, I’m ready for some serious snuggles. I’m a pretty floppy kitty and don’t mind being handled and held. I haven’t shown that I’m a huge fan of other kitties but since I’m young and so social I could probably learn to live around them in the right home. I seem pretty curious about dogs and am fantastic with children so I think I’d do great in most any home — as long as there are people around to play, pet, and snuggle all day long! Looking for a darling little kitty like me? Stop by Pixie today! I come to you fixed, vaccinated, and microchipped for an adoption fee of $100.